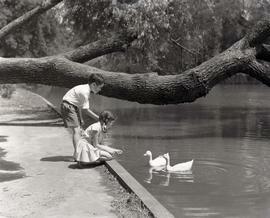 File contains black and white photographs of two unidentified children at a pond. Titled "Fifa" by Fred Schiffer. Photographs damaged in Schiffer's studio fire: 4 photographs salvaged.